Philippine Defense Secretary Voltaire Gazmin and U.S. Ambassador Philip Goldberg signed a historic accord on Monday and signaled a return of American forces to the island nation. 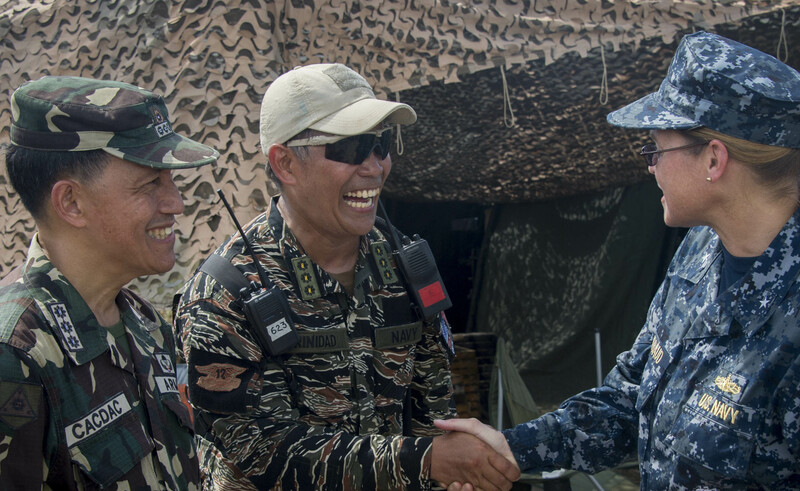 The Enhanced Defense Cooperation Agreement (EDCA) is a framework to enable U.S. forces to access Philippine bases and facilities, as well as pre-position materiel for warfighting and humanitarian assistance and disaster relief (HADR) missions. U.S. military forces had evacuated the Philippines in 1991 following the expiration of 50-year leases on critical bases in country, and amid nationalist fervor calling for a higher financial compensation for their use. The withdrawal was accelerated by the eruption of Mount Pinatubo in Luzon, showering the bases and surrounding countryside with a choking layer of ash, heated mud and lava. While there was strong consideration to keep open what was deemed the “irreplaceable” Subic Naval Base with its deep-water port and repair facilities, the Cold War was winding down and the George H.W. Bush Administration saw little economic value to remain. Now a rising China, maritime troubles with Association of Southeast Asian Nations powers and America’s stated policy goal of maintaining regional stability with a renewed emphasis on the Pacific have changed dynamics in the region. Notably, the Philippines have been targeted by China as an example of how the hegemonic Nine-Dash Line plan would be implemented. Little by little, parts of the Philippines’ maritime Economic Exclusion Zone (EEZ) were occupied or otherwise harassed by a resurgent People’s Republic of China (PRC) Coast Guard and People’s Liberation Army Navy (PLAN). The Philippines have been fighting a holding action as years of neglect and emphasis on anti-terrorism and internal stability operations have reduced the conventional military. President Benigno Aquino’s administration has aggressively sought to modernize all military branches and the Coast Guard but time is not on his side. With that in mind, the stage was set for a dovetailing of goals between the traditional allies. The Enhanced Defense Cooperation Agreement has several stated goals for enhanced U.S. – Philippine military to military operations: Interoperability; Capacity building with an emphasis towards AFP Modernization; Strengthening Armed Forces of the Philippines (AFP)for external defense; Maritime Security and Maritime Domain Awareness. The EDCA will build on ongoing U.S.-Philippine efforts like the annual Joint Exercise Balikatan (Shoulder-to-Shoulder), HADR operations following Typhoon Haiyun/Yolanda and the advisory role of US Special Operations Forces (SOF) since the beginning of so-called global war on terror. ECDA as a framework contains many aspects of the lapsed 1991 arrangement, but includes some important differences that induced compliance to the Philippine constitution, Philippine consent for all U.S. activities and a rotational presence of U.S. military. The Philippines will retain full control of the bases and they would be open to other allies. China’s position is constrained by this arrangement. Unlike the 1991 lease, these facilities are all solely Philippine military bases, in accordance with the country’s constitution. Any attack by the China the bases would be considered a direct attack on the Philippines, as there is no effective way to discern who or what is the target. From a governance perspective, the EDCA aligns perfectly with the Visiting Forces Agreement in that troop rotation ensures no permanent presence. Additionally, Philippine oversight of US activities will continue being managed through the Mutual Defense Board (MDB) for specific military-to-military concerns and the Security Engagement Board (SEB) for all other matters. While none of the bases are explicitly named in the agreement, it’s likely that U.S. forces will return to familiar grounds, such as Subic Bay port, the former Naval Air Station Cubi Point and the former Clark Air Force Base. New facilities which could enhance the positioning of American strength include the proposed expanded patrol base at Oyster Bay in Palawan and a potential U.S. Marine Corps outpost at nearby Brooke’s Point. The latter two locations provide direct access to the Sulawesi Sea Triangle, the contested EEZ and the Spratley Islands. The AFP intends to acquire a third former U.S. Coast Guard Hamilton-class cutter; bolstering their long-range surface patrol in the Western Philippine Sea. As part of non-exclusivity portion of the agreement, the Philippines had indicated the strategic facilities could also be opened to friendly ASEAN and Asian allies. Notably, the AFP has purchased a dozen light-attack jets from Seoul and Tokyo provided a soft loan to replace much of the decimated Philippine Coast Guard’s ship inventory with new 40-meter patrol craft. Although modernization efforts are underway, the Philippines is still pursuing recognition of their EEZ plight through international courts. The nearly 4,000 page memorial was filed with the UN Arbitration Court on 31-March. The ITLOS court in Hamburg Germany is now mulling over the filing and will determine next steps. In the meantime, China categorically refused the arbitration process and threatened that the filing endangered the bilateral relations between the two disputing nations. Armando J. Heredia is a civilian observer of naval affairs. He is an IT Risk and Information Security practitioner based in New England, with a background in the defense and financial services industries. He is a regular contributor to the Center for International Maritime Security’s NextWar blog.